Both Wim Derkinderen and I felt rooted on the spot when they announced we were the winners of the European FinTech Award for “Best of Show”. Earlier that day Wim had pitched the Xpenditure story to an attentive audience of leading names from the banking sector and venture capitalists. Of course, we were always confident about the importance of our solution. However, to outclass 300 other start-ups and scale-ups to win the prize for the best pitch, felt a bit unreal. Apparently, the jury was as astounded by our presentation as we were by winning the award. The message that emerging FinTech solutions can go hand-in-hand with traditional banks as well as their challengers, struck a chord with the panel. Indeed, we have been detecting high demand among banks to work with Xpenditure for some time now. Some of them are already using our solution to link expense vouchers in real time to payments. The fact that Xpenditure addresses a real problem, and has already developed the technology to tackle it, did the rest of the job. 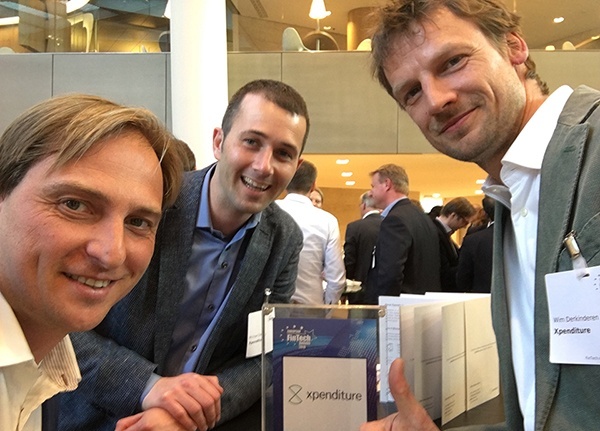 We were already very sure that we could save customers not only frustration, but also a lot of time, however for us this European FinTech award is the best proof of the interest in our solution on the part of the banking sector. The award is, of course, the result of the commitment and resilience of our entire team and the trust and support of our investors. It will strengthen our shared beliefs that Xpenditure is the innovative, digital expense management solution that brings benefits to large enterprises, as well as SMEs and self-employed individuals, and finally yet just as importantly, financial institutions. A big thank you to all of you who supported us in the past few years. We look forward to taking the next steps in our journey with you.